10in x 12in x.025 metal with four mounting holes. 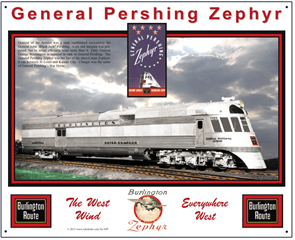 The General Pershing Zephyr passenger train was a salute to our Nations only six star General... General of the Armies was a rank established exclusively for General "Black Jack" Pershing. A six star insignia was proposed, but he never officially wore more than four. Only General George Washington is superior in rank to General Pershing. The General Pershing Zephyr was the last of the shovel nose Zephyrs, and operated between St. Louis and Kansas City. Charger was General Pershings War Horse, thus Silver Charger was the name of the engine. Passenger cars were named after emblems of rank for commissioned Army officers; Silver Star, Silver Eagle and Silver Leaf. General Pershing was World War I's top General who led the allies to Victory. He personally pinned metals on Sgt. Alvin York, World War I's most decorated soldier. Click on image for zoom.